The unique shape of this travisher’s hard maple body is designed to fit comfortably in the hand, making the tool a pleasure to use. Hold the tool lightly with your fingertips and with your thumbs directly behind the blade. 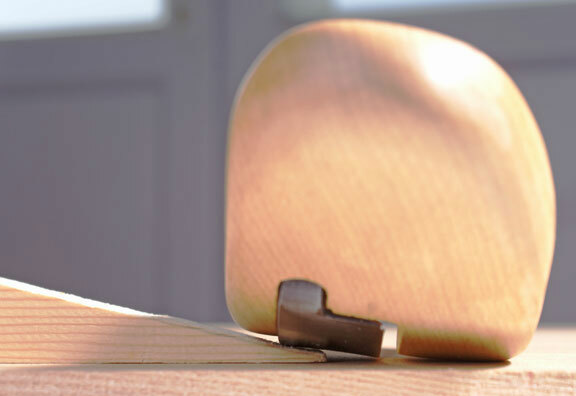 Use the travisher ACROSS the grain of the wood for most of the time except when making final finishing cuts. 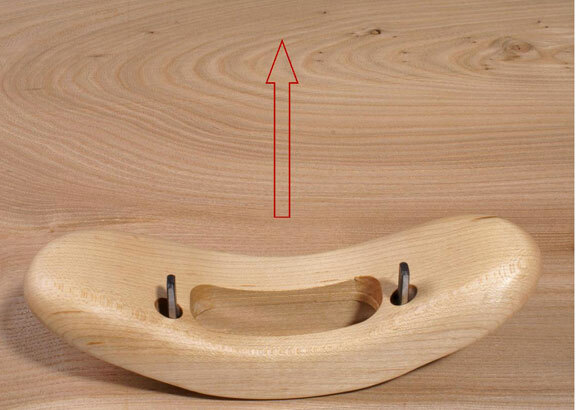 It is much more effective at removing wood when cutting in this direction. Always run the tool with the nose (platform in front of the blade) in contact with the wood to be shaped, then gradually drop the blade down until it begins cutting. You will then be in control and will be able to move in and out of the wood at will. Set the blade as coarse as you can for the work in hand. With practice you will find that you can make very fine cuts with an aggressively set tool (provide you are using your finger tips) and this saves on the number of times that the blade must be adjusted. Skew the tool, like a plane, particularly if working on difficult wood. Keep the blade razor sharp. Over the years I have experimented with various travishers. Our small community of chairmaking enthusiasts here in mid-Michigan seems to agree that the Windsor Workshop travisher is far and away the best choice.